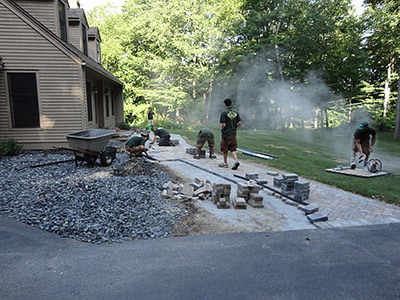 From the Ground Up is a well-experienced landscaping and hardscaping contractor serving Central Vermont and nearby areas. We are the choice of most property owners in the state because of our ability to tackle any kind of renovation job. We also guarantee the successful completion of each project we handle by following our tried and tested renovation process. If you are looking for a reliable contractor, we are the company to hire. From the Ground Up follows systematic procedures when handling renovation projects. Before we start a project, we conduct onsite visits to gather vital information about your project. We value your inputs so will sit down with you to get your ideas, plans, and desired results. This approach helps us create outstanding design plans that satisfy your needs and design preferences. Our primary objective is to bring back the beauty and functionality of your outdoor space. During the installation phase, we utilize our full resources to ensure the successful completion of the renovation project. Our installation team is composed of skilled professionals with lengthy experience on their respective craft. We have seasoned landscapers, certified paver and wall installers, licensed masons, plant experts, highly-skilled heavy equipment operators, and other well-trained professionals. With expert people working on your project, you can expect excellent workmanship and faster completion of the tasks. We also assign a supervisor to monitor the overall progress of the project. Total customer satisfaction is our ultimate goal here at From the Ground Up. We only declare the job done when clients are completely satisfied with our work. We make sure that all the features and amenities are installed according to project specifications and industry standards. Once the renovation project is done, you can now enjoy a more functional, safer, and more comfortable outdoor space. You are also guaranteed of an attractive outdoors with stunning features and amenities. If you want your renovation project handled by the experts in the industry, please call From the Ground Up at (802) 775-1436. We also encourage you to visit us at our Rutland office so we can discuss further our renovation process and service rates.